Stomach capacity is easily the most important factor in determining your ability to become a successful competitive eater or food challenger. You can have the best techniques and strategies in the world, but if you don’t have the stomach capacity required to finish the challenge meal in front of you, or more than the other people you are competing against, you will not win. Just like taking nutritional supplements and exercising cannot compensate for a poor diet if you are trying to lose weight, great eating technique and strategy cannot compensate for poor stomach capacity if you are trying to win a food challenge. As you learned by reading All Stomachs Were Not Created Equally in the Food Challenges 101 section, no two stomachs are the same, and some people are genetically predisposed to being able to eat more than others. Your stomach is full of tiny muscles that expand (relax) and contract during a process called peristalsis which helps move digesting food through your stomach into other organs to continue the digestion process. Think of your stomach muscles just like you would think of your skeletal muscles that help you move and lift weights. Just like it is possible to strengthen your skeletal muscles through exercise and lifting weights so that you can lift heavier items, it is also possible to train your stomach muscles to expand further so that more food/liquids can be consumed. Stomach muscles can only be expanded to a certain point – You may lift weights religiously for years, and you may continue to progress as time goes on, but your body will only be able to reach a certain level naturally. While your neighbor is bench pressing 400 pounds for multiple repetitions, you may never be able to bench press 300 pounds. As mentioned above, some people are genetically predisposed to being able to lift more than others. This same phenomenon exists with stomach capacity. You may train consistently for years, but you may never be able to eat more than your friend who is naturally able to eat a lot. He or she may have a body type that is more prone to having a higher capacity level. Your genetics and body type play a big role in deciding the maximum potential that your muscles can reach, but all muscle performance can be improved through consistent training. You must adapt your training regimen to fit your body type and capabilities. If you don’t use it, you will lose it – If you workout consistently and eat correctly, you will build muscular strength and endurance, and you will eventually be able to perform at a higher level than when you first began training. Once you build that strength and endurance, and reach the level that you were aiming for, you must continue exercising your muscles to maintain that strength and endurance. If you quit training and stop working out, your muscle strength and endurance will decrease and eventually go back near the level that you started at originally. If you don’t continue to maintain your stomach capacity, your stomach muscles will contract back to being near the size that your stomach was at before you began training. If you actively compete in eating competitions, you can build a pretty high stomach capacity. If you then take multiple months off and let your body rest, you should definitely not expect to compete at the level you ended at previously when you start competing again. You must train your muscles again to get back to the level you were at when you stopped training. Rest is important and vital to recovery & improvement, but there is a such thing as too much rest. It is possible to overtrain – In the fitness world, overtraining is a physical, behavioral, and emotional condition that occurs when the volume and intensity of an individual’s exercise exceeds their recovery capacity. They cease making progress, and can even begin to lose strength and fitness. Overtraining is a common problem in weight training, but it can also be experienced by runners & other athletes. Overtraining can be experienced by competitive eaters trying to expand their stomach capacity too. When lifting weights, you should not exercise the same muscles every single day. You need to let your muscles rest and recover so that they are able to grow and get stronger. Your stomach muscles operate the same way, and you should not train to increase your stomach capacity every single day, and especially multiple times per day. If you do train too often for a long period of time, your stomach muscles will start to experience overtraining symptoms. You will notice that your stomach capacity is starting to decrease and you will get fuller faster. If you are training with food, you will more than likely experience excess weight gain too. To recover from overtraining your muscles, you must let them rest for a long period of time until they have recovered back to full strength. There is no other way. The higher your stomach capacity is, the more foods and liquids that you will be able to safely fit into your body during a food challenge or eating contest. Stomach capacity plays an even larger role in longer eating contests than it does in challenges. 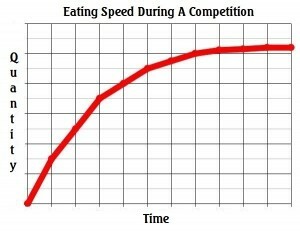 As shown in the graph to the left, eating speed during a food competition has a geometric pattern, meaning that you start off very fast in the beginning and your speed begins to decrease as time goes on until you are basically crawling at a snail’s pace. The point where an eater feels like he or she is completely full and is no longer able to continue eating is known as “the wall.” You can immediately tell when an eater has hit “the wall” by his or her face and body language. When you hit “the wall,” you begin chewing without wanting to swallow. The higher your stomach capacity is, the longer it takes for you to hit the dreaded “wall.” That is why stomach capacity plays such a huge role in eating contests, because eaters with a larger stomach capacity are able to eat faster and more food for a longer period of time. Longer eating contests last between 6 and 10 minutes, while longer food challenges last 45 minutes to 1 hour, and therefore an eater has more time to work with. The eater can start off very fast the first fifteen to twenty minutes, and then he or she has additional time to coast to victory. Just like when training with weights, you must build your capacity and endurance slowly. As the saying goes, Rome was not built in a day. If you try to lift too much weight, it can fall right on top of you and you can get seriously hurt. You can also tear your muscles and fracture your bones and joints. If this happens, you must take a long time off so that you can recover. You therefore are unable to compete in any activities until you are healed, and you will lose all of the strength and endurance that you worked so hard to gain. If you are not careful and overtrain your stomach muscles, you can get seriously hurt. As mentioned in The Dangers Of Competitive Eating, it is highly unlikely that your stomach muscles will tear, but you will more than likely end up throwing up, and throwing up often for a long period of time can have seriously damaging effects on your body and digestive organs. You will also more than likely gain a significant amount of excess weight. You will then be forced to take a long period of time off so that you can let your body rest and lose the excess body fat, and therefore you will not be able to compete in many eating competitions, if any at all. True stomach expansion takes time and a lot of consistent training. There are no shortcuts. For more information about that, click here. Thanks for reading about how stomach capacity training works and using FoodChallenges.com! !